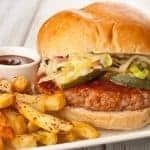 Basted with a quick homemade barbecue sauce during cooking, these tasty pork burgers are seasoned with the same spice mixture we use in the dry rub for our pulled pork. 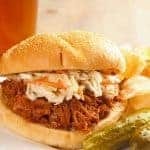 The end result is a tender, juicy burger with a mild barbecue flavor that’s reminiscent of a classic pulled pork sandwich – right down to the pickle and coleslaw topping. Prepare the sauce by whisking the ketchup, molasses, vinegar, Worcestershire and tomato paste together in a small bowl. Set aside. Note: If using brown sugar in place of the molasses, make sure it dissolves completely. Place the ground pork in a mixing bowl. Add the tomato paste, salt, paprika, garlic powder, onion powder, dry mustard and a few generous grinds of black pepper. Use a wooden spatula to combine the meat ingredients as best you can before doing a final, gentle mix with your hands. Divide the meat into four quarter-pound portions and form into 1/2-inch thick patties. 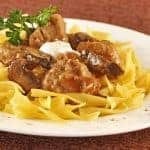 Make a slight depression in the center of each with your thumb then transfer to a plate and chill for at least 15 minutes before cooking. While the burgers chill, preheat a grill or grill pan to medium-high. For best results, oil the grates before adding the burgers. Grill on the first side until you see juices start to accumulate on the top of the meat, 2-1/2 to 3 minutes. 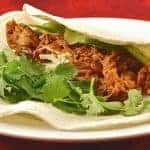 Flip them over, brush some of the sauce over each burger, and continue cooking to desired doneness, 2 to 3 minutes longer. 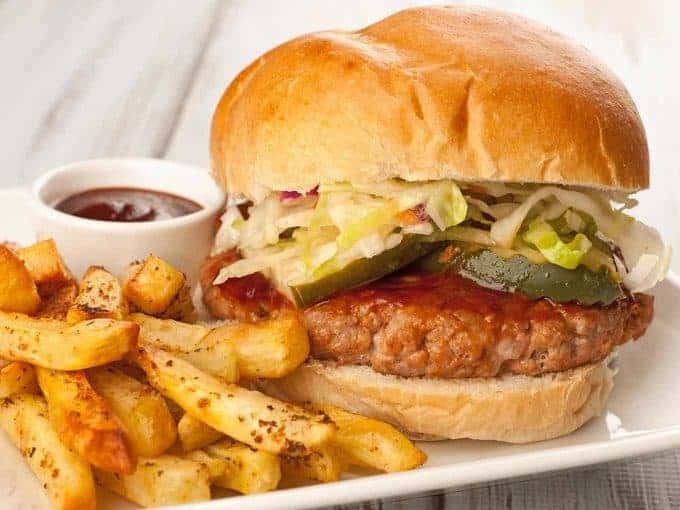 Transfer the burgers to the rolls and top with additional sauce, pickle slices and coleslaw. 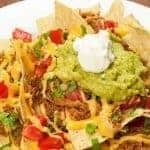 Serve with a side of fries or chips.